It took some time, but I have mastered this pattern (at least the Medallion part). Hubby fixed a neat set up to guide the fabric on my Designer 1. I have always used the foot with the metal guide,but then I would have the “trail off problem”. 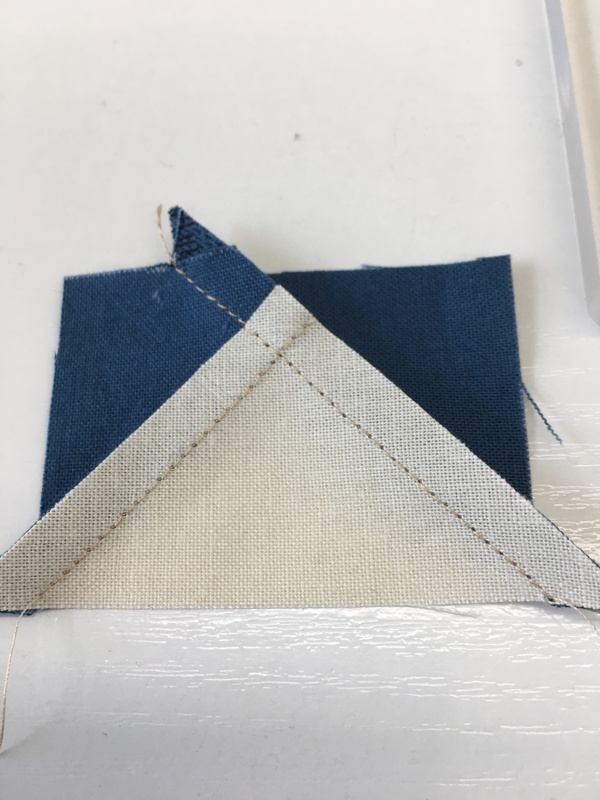 Start with a 1/4″ seam and end up with an 1/8″. He took one of my old creative grid rulers, removed all the markings and cut a 1″ x 2 3/4″ piece from it. Then he taped it on with painter’s tape. I use painter’s tape on my featherweight for a guide and it works well, but this is absolutely wonderful! The plastic is under the tape. He has added a marker on the right side because I will have to move the guide each time I change the bobbin but who cares since I get such beautiful seams now! Now for the real accomplish – TaDa – Robin’s Nest Medallion on the Design Wall. 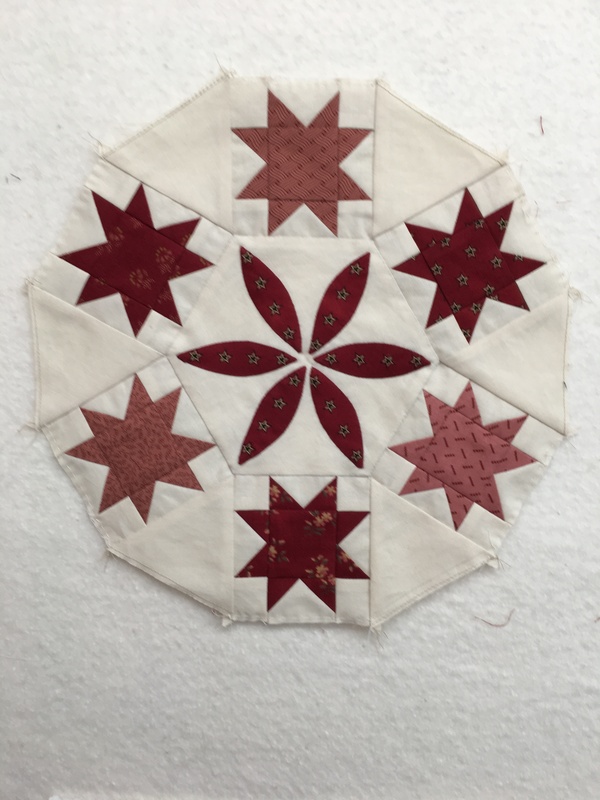 It is hard to believe that it took 2 weeks to make this – TWICE – When I was ready to sew the center Hexagon on – I found out that it was off at least 1/8″ off on 3 sides – not good. So that problem was corrected and I appliqued it to the first ring. Now on to the 2nd ring of Blue stars. Yesterday and today I finished them and here they are on the Design Wall. I will probably take a day off tomorrow from quilting and may do some hand quilting, or maybe just applique, OR we may do a day trip just to get out of the house! I made 4 dark blues, 4 medium blues, and 4 light blues and the setting triangles are black with a wheat design. 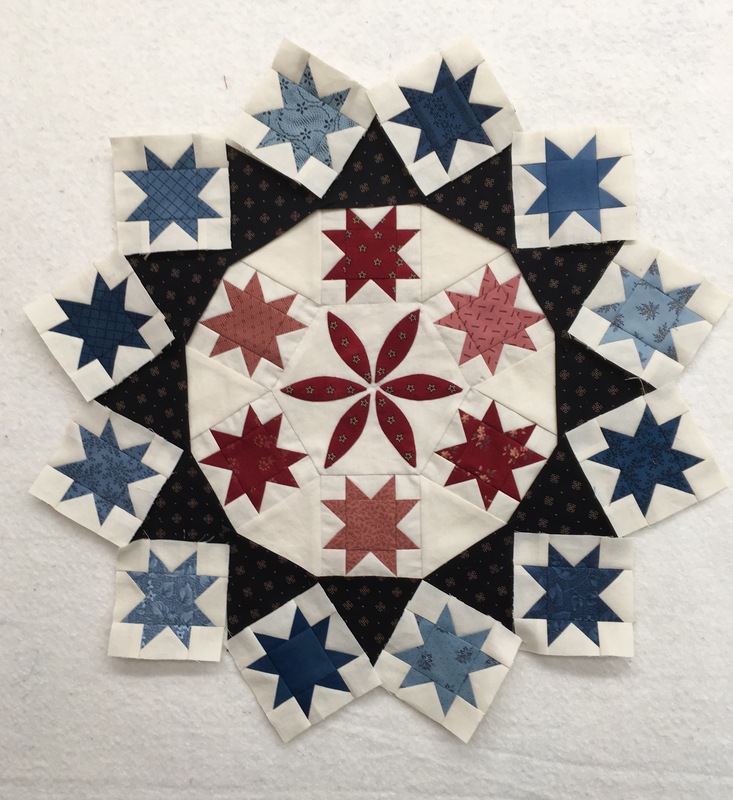 I did not have one problem making these stars since I discovered Jenny Beyer’s video on cutting the Flying Geese background by cutting a square and then cut it in diagonally twice. NO MORE BIAS PROBLEMS! Each star would come out just perfect at 3 1/2″! I also want to thank Clay for taking the time to help me with the guide for my machine! Great to have an Engineer around. A lot of frustrating and hard work, but it will be a beautiful quilt and I plan on showing it next year. I hope your day went well and that you have plenty of time to sew this week. This entry was posted in Quilting and tagged Robins Nest. Bookmark the permalink. Lovely! She’s beautiful and perfect. Can’t wait to see what comes next. Well, after I get the blue ring sewed I have to cut out a 25″ background piece and applique the stars to it. This quilt will take some time but that is OK. It will be worth it in the end. Thanks for that link, Becky. He is very good at improvising. On computers I am the Software person and he is the Hardware person. I have been using that type of foot for years and what is great about what he came up with is the fact that you have more than just an inch to line the pieces up! I use painter tape about 1/4″ thick cut on my Featherweight. Thx for your comment. How is your Long Arm coming along? Your work is lovely and so precise. Robins Nest will be beautiful. I love clever ways to solve an issue like that. I have many tapering off problems. Robin’s Nest will be so beautiful. 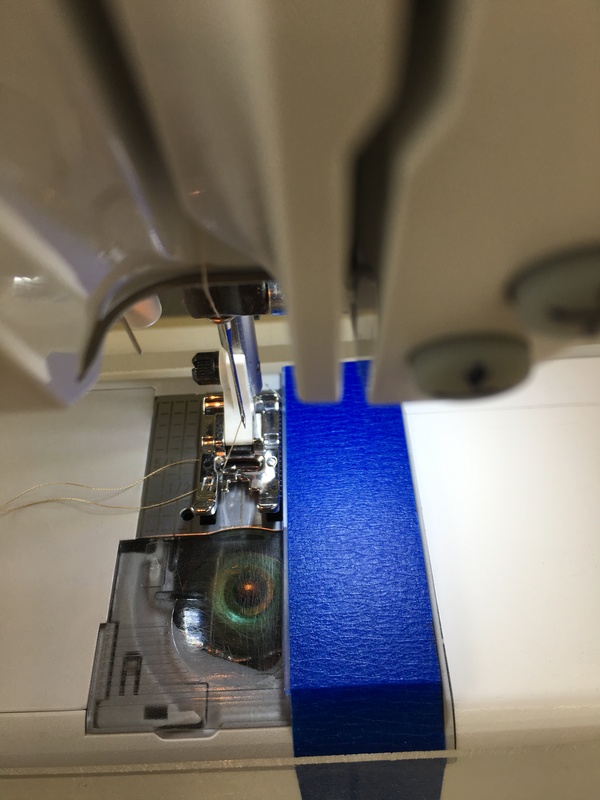 If you use the foot with the piece of metal on the side, I have found that for accurate allowances I slow my machine down – and still can get uneven seam allowances. This takes care of all of that! Clay has my long arm table and issues working great and now this – I am in quilting Heaven! Have a great day and thank you for the comment. Well. It was. And there were issues with the pattern. I gave up on it. Take care and thx for your comment.